We’ve experienced the first big rains of Spring and with that comes danger in certain areas. A woman in Vereeniging found her car slipping away with the water. 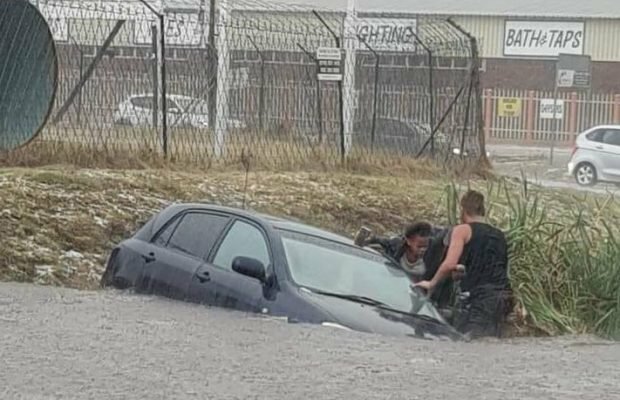 A photo is doing the rounds of him helping a family in need who was trapped in flash floods in the Vereeniging area. We found him! Shaun Boshoff is an average student but he did something extraordinary! He tells Martin Bester: ”It was instinct. I saw a family in need and I had to help." He has a passion for motorbikes and was on his way to view a motorbike. He jokes with Martin Bester and says,"I anyway did not get the bike I wanted."